Mahindra & Mahindra Ltd, who currently sells the Mahindra Scorpio here in Malaysia is planning to assemble pick-up trucks here in Malaysia in 2007. Assembly will be done through a joint-venture with Mahindra’s current distributor USF-HICOM (Malaysia) Sdn Bhd. 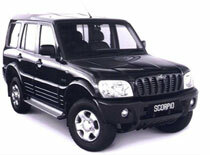 The Mahindra Scorpio is currently offered in petrol and diesel versions here in Malaysia. While it looks like a rugged off-roader, it actually has no 4WD ability. Not sure if the diesel variant has it or not, but the petrol one definitely doesn’t.